As many know, I tore my meniscus on my left knee near the end of January and shortly thereafter had to have surgery to repair it. Because of this I was unfortunately off the water for a good six weeks or so, which was extremely difficult for me! Just these last two weeks I’ve been recovered enough to get back out and start fishing. I haven’t been going every day, but I’ve been able to run a few trips a week even though I’m still on crutches. It isn’t the easiest thing in the world, but it sure beats not fishing at all! Over these last two weeks I’ve encountered a wide spectrum of fishing quality. As is often the case this time of year, the weather is all over the place, and the fishing changes constantly. This year has been no exception. So far in March we’ve had snow on several days, a long stretch of super bright, super cold days, and plenty of strong winds that have kept me off the water. The fishing has varied every bit as much. 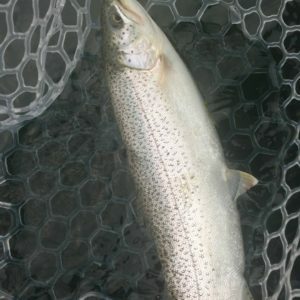 The cutthroat fishing in the South Sound as well as the Hood Canal has slowed down quite a bit for me this last week, and I believe many fish are up in the creeks right now spawning. It doesn’t take these fish long to do their thing, so I except fishing to turn back around very quickly. The bright weather has made fishing for the fish that are still around in the saltwater quite difficult. As much as I enjoy spending time on the sound on a beautiful, blue sky day, those days pretty much stink for fishing. 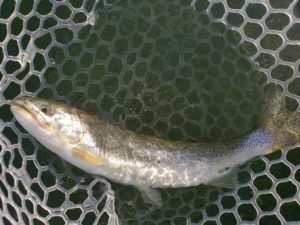 When we’ve been finding cutthroat, especially on days that aren’t as bright, they’ve been quite willing to eat just about everything we’ve showed them. 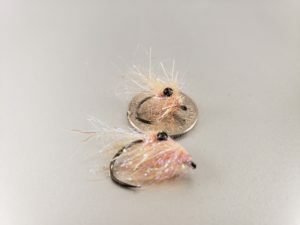 Squimp patterns continue to be my top producer, but Delia’s Squids, Clousers, Flatwing Baitfish, and lately Chum Fry patterns have all been getting the job done. 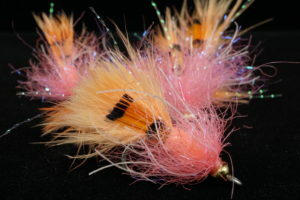 Large Bunny leeches in whites, pinks, oranges and flesh colors tied with Spawn Fly Fish Heads have been quite productive as well. The hardest part about catching some sea runs right now has been just finding some fish, and then not spooking them in the bright conditions. Most of the fish I’ve been seeing have been found fairly close to creek mouths in the South Sound, which of course makes sense given that many of these fish have been in spawning mode for a bit now. Always keep in mind that spawning is a taxing time on these fish, and if you start encountering many long, snaky, worn out looking fish these are most likely freshly back in the salt after spawning and its a good idea to move elsewhere and give these fish a chance to rest up and get their strength back. I’ve been seeing small schools of Chum Fry for about two weeks now. Not in any great numbers, but they are starting to trickle into the sound. 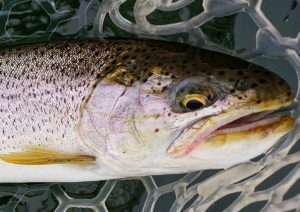 Within the next few weeks the sound should start to really fill up with these delicious cutthroat treats and the fishing should start getting extremely good. 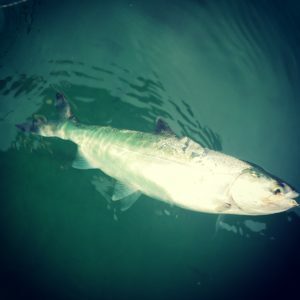 The resident coho fishery in the south sound has remained fairly consistent, although these super bright days we’ve been having so far this month have a tendency to make locating these fish more challenging, and getting them to eat a fly even more so. The coho seem to get pretty skittish in the bright weather, often not showing themselves and being extremely spooky even when spotted. Often my best plan of attack is to try to get in front a pod of fish, and just shut the boat off and drift silently and hope we can get some flies in front of them. 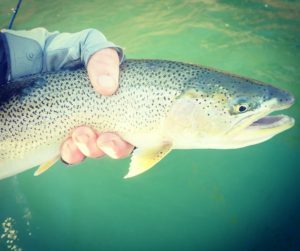 Generally when we can find some fish, and cast to them without spooking them, they have been eating just about everything we’ve been showing them. We had one day last week where there was nice cloud cover and the fish were jumping all over the place, but they were extremely selective. Luckily that only lasted a single day. 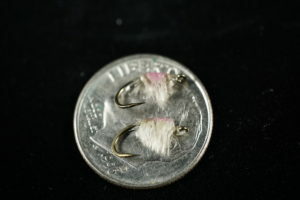 Squimps and Delia’s Squids are still my top producing coho flies. Look for these fish to be showing themselves in any location with good current, especially rip tides. Always keep an eye out for jumpers. In the bright weather they tend not to jump as often, so spotting a single jumping fish can be crucial as often just a single fish will give away the location of good numbers of fish. 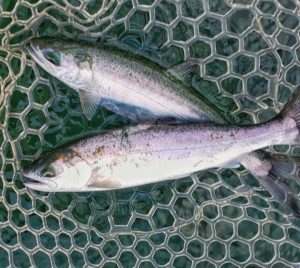 Winter 2019 continues to provide some stellar fishing for both sea run cutthroat and resident coho, unfortunately I won’t be out there to enjoy it for a little while. While on a trip recently I tore my meniscus in my left knee, and am now at home on crutches, unable to walk or do much at all, until Wed the 6th when I get in to see the orthopedic doctor. This has been a very disheartening set back, but I between my amazing wife and son here at home, and all the support from friends and family via texts, calls and emails, I will power through this and be back and better than ever in no time! Fortunately it sounds like the procedure for dealing with a torn meniscus and the following recovery is not terribly bad compared to other knee injuries, so I shouldn’t be out too long. Up until my injury, fishing had remained quite good. 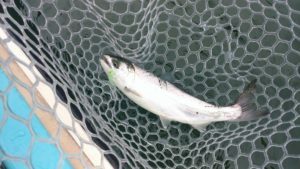 The resident coho fishing has been quite good in particular, with large schools of coho being found throughout the south sound. This has provided some extremely fun, and sometimes extremely frustrating fishing. When we encounter schools of these fish they seem to be one of two varieties…. Either the extremely aggressive coho (My personal favorite!) that are willing to eat just about anything we show them, or the extremely selective variety that are feasting on euphasids and other ultra small stuff. These fish can be MADDENING. 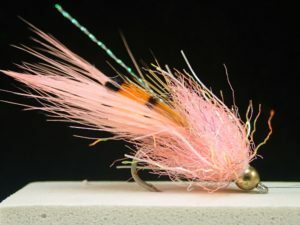 Trying to “match the hatch” with a fly that actually represents what they are eating is frustrating at best, and down right impossible at worst. We’ve been trying everything we can possibly think of to crack this code, and while we’ve been catching fish on just about every fly we show the, I definitely don’t feel like we’ve cracked the code. I’ve been experimenting with tying some ultra tiny stuff for these scenarios, but quite honestly nothing has been working any better than my standard offerings. 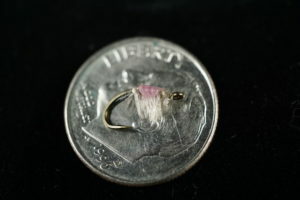 Casting super small euphasid/shrimp/scud type patterns to fish that are sipping on the surface is a lot of fun at times, but boy can it be frustrating. 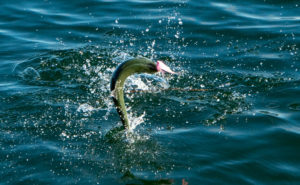 A floating line and long leader is needed for this type of fishing. 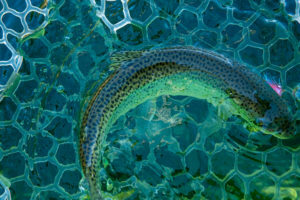 If possible cast directly into the rings left on the water as these fish sip these small bugs near the surface. Every day seems different… Sometimes just letting the fly settle and not moving it at all is enough to draw interest, other times short, slow, twitchy retrieves will elicit a take. 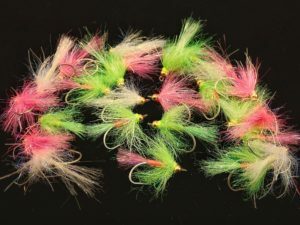 If you get tired of this type of fishing, as I often do, then quite honestly our best numbers have come from casting small Delia’s Squids or Squimp patterns into the schools of coho and picking off the more aggressive fish. While this type of fishing can leave you wondering what you could have done to catch even more, it has definitely provided enough action to keep us satisfied. It seems throughout the day at various times these same fish will get ultra aggressive, but I’ve yet to really figure out what triggers this change to aggression. 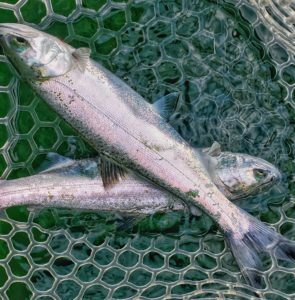 I have seen large schools of sandlance present in many of the areas where coho are present, and while I have witnessed coho actively feeding on these sandlance, I have yet to have any interest in sandlance patterns when I’ve tied them on. 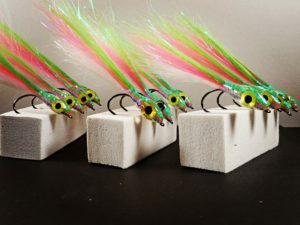 So keep an eye out for fish that are obviously on bait, and consider showing them a baitfish pattern at those times to see if that may get some interest. 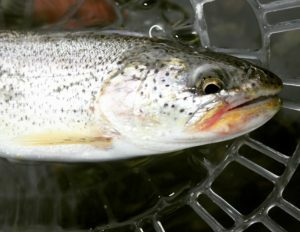 Cutthroat fishing has slowed a little bit my last few trips, and I have a hunch that some fish have begun their journey into the creeks to spawn. 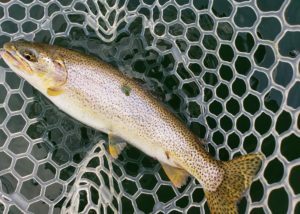 That said, fishing for cutthroat has still remained quite good, but it seems we’ve been finding them in less than traditional places. From the boat it often takes covering a lot of water, and making a lot of casts, until we are able to narrow down where the fish are hanging at any particular moment. There doesn’t seem to be a real distinct pattern that I can find, but the best advice I can give anyone is to just fish as much as possible, cover as much water as possible, and keep casting. Eventually you’ll find them! Once found, the fish have not at all been picky…. With large flatwing patterns and Squimps being the top producer lately. There have been some extremely large fish around as well lately! Three times in one particular area we have spotted one of the largest cutthroat I’ve ever seen. It has followed flies right to the boat all three times, then casually turned away. Its such a special treat to even see a fish of that size in the sound, but boy I would sure like to put that one in the net one of these days! If possible fish on darker/cloudy days. 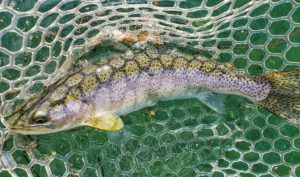 We’ve had quite a few bright weather days the last couple of weeks and the fish, both cutthroat and coho, seem particularly sensitive to it and it has really affected the fishing. On these days I suggest trying to fish the first couple hours of the day and the last couple hours of the day as hard as you can. These early and late low light hours have proven to be extremely productive, especially on brighter days. 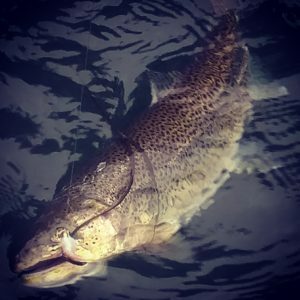 So far the winter of 2019 has found the Puget Sound showing us some incredible fishing! 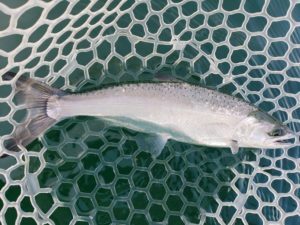 Sea run cutthroat have been fat, hungry, and aggressive, while the winter resident coho fishery is officially in full swing. 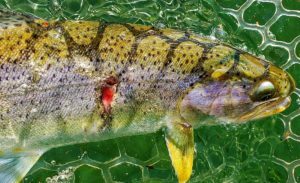 I keep waiting for the cutthroat to make a transition where they stop responding as well to baitfish patterns, but up until this point this has not happened yet. 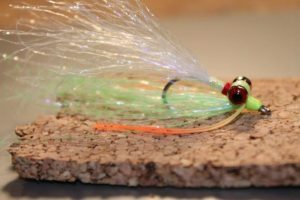 Most winters I tend to fish smaller, attractor style patterns much more than baitfish because the fish just don’t seem to respond as well to the larger baitfish patterns. Squimps, Delia’s Squids etc tend to dominate my winter fishing. This year has not been the case. 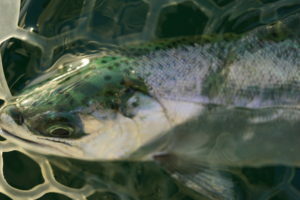 We’ve been finding great cutthroat action fishing larger, flatwing style baitfish patterns. 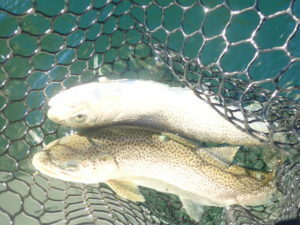 For the most part our best cutthroat fishing this winter has come from flat, oyster covered beaches near creek mouths. Steeper, structured beaches have been putting out some fish, but by far our most productive fishing has been on these shallower flats near the creeks. 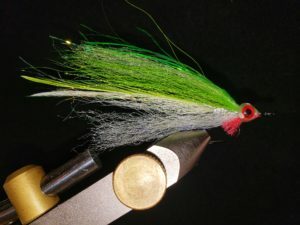 Flatwing baitfish patterns fished on sinking lines have been producing some savage grabs and some really nice, large cutthroat. 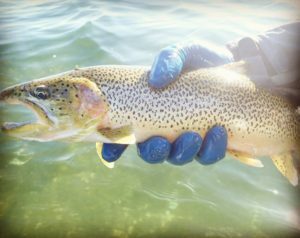 These flies are a ton of fun to fish because when a cutthroat decides to eat one, it’s not a subtle experience! Hang on to your rod! Depending on the depth and the current I am fishing these patterns using anything from intermediate lines all the way up to type 7 sinking lines…. But I would say the type 3 Airflo 40+ has been my most used line this season. I like to fish a little faster sinking line with these neutrally buoyant flatwing patterns, as the line pulling the fly down during the retrieve produces a diving/darting action that these fish seem to find irresistible. If you find oyster beds, be sure to make some casts! Along those same lines, I just discovered that my salmon charter license also allows for shellfish harvest, so a new addition to the South Sound Skiffs fly fishing trips is the option to pull the boat up on a public shellfish beach and pick a limit of oysters. Pretty nice little bonus for those that enjoy eating this Pacific Northwest delicacy! The resident coho fishing is definitely in full swing, and we’ve been finding coho from deep in marine area 13, all the way up into parts of marine area 10. 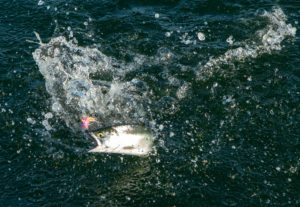 Marine area 11 is right in the thick of things right now, and there are a LOT of fish around to target with the fly. 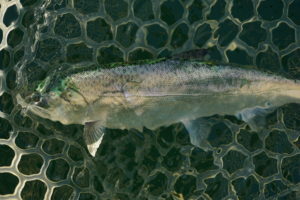 Thus far this winter the coho have been quite selective, often ignoring my usual winter offerings even when we find extremely large concentrations of fish. These fish have been gorging on euphasids/krill/amphipods etc and have been so focused on this small stuff that they will ignore many other offerings. We are still finding some stellar fishing, but it’s not quite shooting fish in a barrel. I have to admit that solving the puzzle of what this fish will eat from a day-t0-day basis is something I highly enjoy. 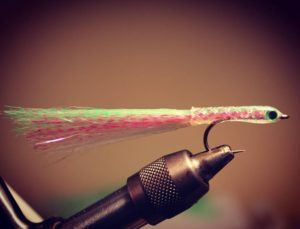 Smaller Delia’s Squids, Squimps, my Glow in the Dark Coho Comet and other traditional coho patterns have been producing plenty, but when the fish are sipping small stuff on the surface a floating line, long leader, and small euphasid patterns are worth a shot. No matter what fly you’re fishing be sure to experiment with your retrieve throughout the day. This has often made a big difference with the fish showing a preference for slower, or faster retrieves at different points in the day. Same goes for line selection… If you are casting to coho that simply aren’t responding to your offerings, try changing up your line. 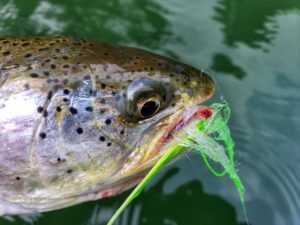 By going deeper or shallower, and changing the angle/depth/retrieve of your fly you can often get dialed in enough to turn a rather slow day into one full of action. From the beach I like to target tide changes, especially the hour prior through the hour after a tide change where the rips will often set up within range. Find some nice rips and you’ll probably find some coho. So far this winter we’ve been having our best luck with herring and sand lance patterns, especially in areas where we are finding large concentrations of bait. We’ve been encountering balls of herring that are so big it often makes it difficult to get a fish to notice a well tied imitation. 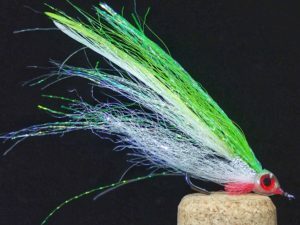 As such we’ve had our best luck fishing patterns that maintain the proper baitfish profile but are tied a bit larger, flashier, and in non natural color schemes. A pink/white/chartreuse UV Resin Popsicle Stick has been getting the job done where a more natural imitation is often getting “lost in the crowd” so to speak. 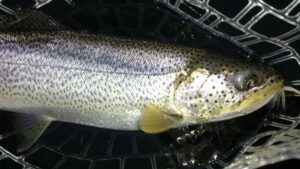 It’s an abundance of riches in the south Puget Sound right now when it comes to the variety of food sources available for cutthroat, so showing the fish a fly that is a bit larger, brighter, and flashier seems to get their attention much more effectively. 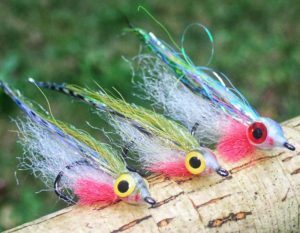 A selection of our favorite “attractor” style baitfish patterns. In spite of nasty weather this winter we’ve still been finding plenty of nice fish. 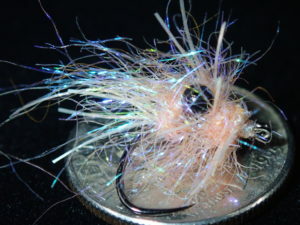 Shrimpy patterns have been producing the best for us this week, with the dubbing brush Squimp being the clear winner. Fish have been fairly spread out, with the heaviest concentrations being found in the vicinity of small creek mouths, probably as fish are preparing to head up to spawn. Finding moving water has been crucial, and we’ve found that having a boat is critical for finding this water. If you’re fishing the beach I’d suggest focusing on larger points, creek mouths, and anywhere the water gets funneled down to increase flow. Its hard to beat this fishery, especially considering it is the dead of winter!! This Squimp pattern has put countless fish to the boat the last few days and is still going strong! Here’s a video from yesterday’s trip on the sound. It didn’t stop raining all day long, but luckily the fish didn’t mind! Rain gear required for this one!